We’d love your help. Let us know what’s wrong with this preview of London Crime Thriller Boxset by J.F. Penn. Detective Jamie Brooke must overcome her own tragedy and work alongside reluctant psychic Blake Daniel to solve a series of shocking murders against the backdrop of a divided London. LONDON. When the body of a young heiress is found within the Royal College of Surgeons, Detective Sergeant Jamie Brooke is assigned to the case. An antique ivory figurine found beside the body is the only lead and she enlists Blake Daniel, a reluctant psychic, to help her discover the message it holds. DEVIANCE Who is the sinner and who is the saint? To ask other readers questions about London Crime Thriller Boxset, please sign up. Individual reviews of each book below. As for the box set itself: three intriguing books, beautiful formatting, and great value! After hearing J.F. Penn talk about her "dark" fiction on her podcast and in interviews, I thought I should finally give it a try. This definitely deserves a content warning – Desecration features physical violence, corpse "art," and extreme body modification. Not for the faint of heart. Luckily, I have an iron stomach, so I found the topics both grotesque and Individual reviews of each book below. As for the box set itself: three intriguing books, beautiful formatting, and great value! After hearing J.F. Penn talk about her "dark" fiction on her podcast and in interviews, I thought I should finally give it a try. This definitely deserves a content warning – Desecration features physical violence, corpse "art," and extreme body modification. Not for the faint of heart. Luckily, I have an iron stomach, so I found the topics both grotesque and fascinating. As for the book itself, it's well-written and fast-paced, with a strong cast of characters. My only critique is that the writing became repetitive at times, with the narration rehashing past action and/or characters' motivations and feelings. However, this does help keep the details clear and isn't too distracting from the plot. Recommended for readers who like violent crime, the dark side of medical history, and a dash of the supernatural. This trilogy really hits its stride in book two. Penn gives her characters more depth, and I especially enjoyed learning more about Blake's past and his visions. The theme of mental illness runs throughout, providing both gripping entertainment and moments of deep introspection. I really enjoyed this novel and look forward to finishing the trilogy! I enjoyed these books however I did feel that the first, Desecration, had a rather rushed ending. Almost as if the writer had got bored of writing and decided to end it s soon as possible. The other two books had better endings, although it was fairy obvious who the perpetrator was. Although I felt compelled to finish this trilogy it wasn't really my type of fiction. I liked the first novel the most but as I continued to reads through the there two tales I felt I was increasingly required to suspend my belief in reality. I know many people enjoy these types of stories and if you like stories about paranormal events and people then I would certainly recommend the first story - Delirium. The pace of the narrative increases as the novel progresses but each story starts off ver Although I felt compelled to finish this trilogy it wasn't really my type of fiction. I liked the first novel the most but as I continued to reads through the there two tales I felt I was increasingly required to suspend my belief in reality. I know many people enjoy these types of stories and if you like stories about paranormal events and people then I would certainly recommend the first story - Delirium. The pace of the narrative increases as the novel progresses but each story starts off very slowly and takes a long while to become compelling . I am a pretty fast reader but if you are slower I am not sure you would be willing to plod through nearly the first half of the novel before you become invested in the plot or characters . I was supposedly reading this book for nearly three years, this is only true in so far as I decided to read it but then many other books intervened and I delayed both starting and finishing. In summary if you enjoy novels about the paranormal then i think you might enjoy these but otherwise I would skip them. 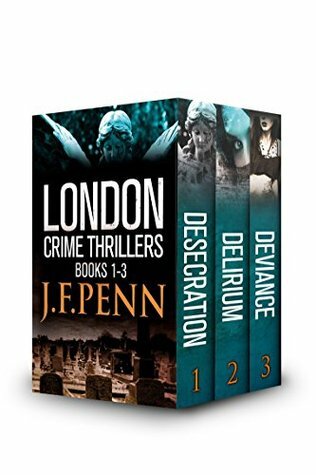 London crime thriller boxset by Penn. I really enjoyed reading these three stories, despite the macabre. Joanna's description of everything was very entertaining, even down to O's tattoo of an octopus. There was deviance everywhere and the righteous people who wanted to close down Southwark. I enjoyed the characters of both Jamie and Blake - they seemed very real with all their flaws. A fitting end to Jamie's nemesis. Well researched. I felt that I was walking along the characters as they gathered clues. The descriptions are full and place me in each scene. Some of scenes are very dark and that comes from a practicing Private Investigator who investigates homicides. The arc of the stories moves briskly from one case to the next to the finale. I found them to be credible from a police procedural standpoint and the plots had enough twists to keep me guessing. This package of three books is a joy to read. I read all three in just a few days, because the stories were so gripping. The two main characters are sympathetically flawed, and are just brilliant. Do not miss this great set of novels! I enjoyed it immensely. The characters were well drawn. I especially liked the setting south of the river. We visit London regularly and are well familiar with the North side so she has got me interested in doing a lot of walking on the other side. Too slow after 4 chapters. Could not get my interest after 4 chapters. The plot was too slow providing any excitement to grab my attention. London Crime Thriller Boxset is a great mystery set of Jaime Brooke and Blake Daniel. Jaime is a Detective Sergeant, trying to solve the crimes with the help of Blake. Readers who have been reading the ARKANE series, will recognized Blake Daniel from Day of the Vikings. In Desecration, Jaime is trying to solve the murder of an heiress found at the Royal College of Surgeon. She is referred to Blake Daniel from one of her colleague to help her when her suspect has powerful political connection. At London Crime Thriller Boxset is a great mystery set of Jaime Brooke and Blake Daniel. Jaime is a Detective Sergeant, trying to solve the crimes with the help of Blake. Readers who have been reading the ARKANE series, will recognized Blake Daniel from Day of the Vikings. In Desecration, Jaime is trying to solve the murder of an heiress found at the Royal College of Surgeon. She is referred to Blake Daniel from one of her colleague to help her when her suspect has powerful political connection. At the same time, Jaime is coping with her terminal-ill daughter. In Delirium, Jaime is investigating the murder of prominent psychiatrist found in the old hospital of Bedlam. Jaime is also mourning the loss of her daughter. Blake is there, in sending text messages to cheer her up everyday. The only way, Jaime is dealing with the loss of her daughter is to be at work. This time in this book, Blake is discovering his heritage of his abilities when his father passed away. Jaime is also discovering that there is a shadowy organization operating within the British government. With so much to lose, Jaime's career is on the line. 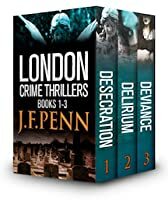 In Deviance, Jaime is a private investigator, investigating the the murders of tattooed artists and outcasts of Southwark. The serial killer known as the Skin Collector, is leaving his tattooed victims with their tattooed skin flayed. She and Blake have to find the Skin Collector before he claimed another victim. The London Crime Thriller Boxset is a great way to discover Jaime Brooke and to continue to follow Blake Daniel in this new series. This series does have a supernatural element. Of course, the readers won't know until they have read the third book, Deviance. I would recommend that the readers read these books in order to follow Jaime and Blake's stories. Even if the readers have read any of these books out of order, they will be reading the other books to find answers and to fill-in the blank to see if there is a relationship between Jaime and Blake. I was given this set of ebooks from the author in exchange of an honest review. I was not compensated or influenced in any way for writing this review. Very good read. They can be a bit graphic so if you have a weak stomach you may not want to read. They have a good plot and keep you guessing. These books were a great read. I enjoyed following Jaime and Blake's unfolding relationship. The descriptions were incredible, including Jaime's shattering loss. The only reason I ranked it four stars is because there is a lot of graphic violence, which is very unsettling. Excellent read. Enjoyed the fact it was bang up to date about London Borough of Southwark. Must be read in order to make sense. Enjoyed immersing myself in a good story line wrapped around places I know. There needs to be a lot more to follow about Blake. I was left hanging in that regard.